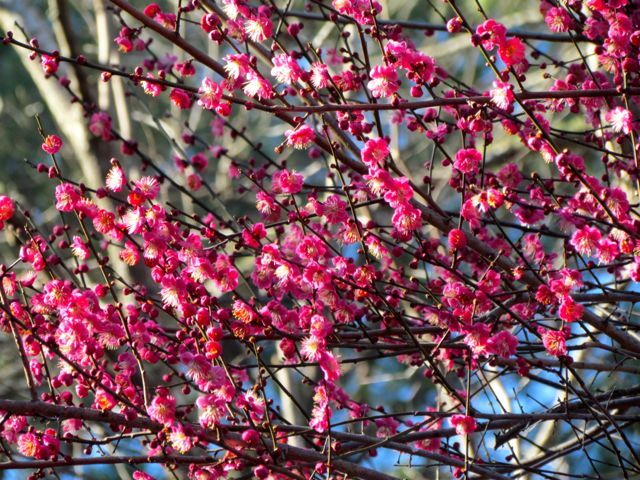 Pink-flowering ornamental apricot near maximum bloom. I am not a gambler. I don’t buy lottery tickets or spend money at casinos. I am not a gambler — except when I garden. As with any game of chance, all the variables involved in gardening cannot be controlled by humans. In truth, even the plants are gamblers. My lovely ornamental flowering apricots are prime examples. Ten days ago, they were barely blooming, but a slightly (and I do mean slightly) milder round of weather this week persuaded them to open fully for business, much to the delight of my neighbor’s honeybees, who were also out taking advantage of the relative warmth. 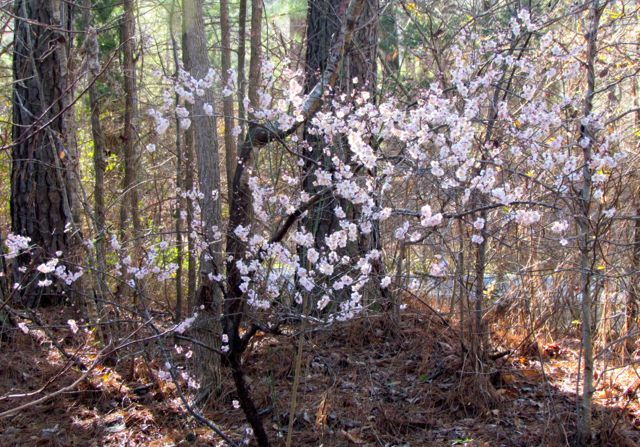 Prunus mume ‘Peggy Clarke’ (Senior) is wafting her delightful cinnamon scent across half my yard. 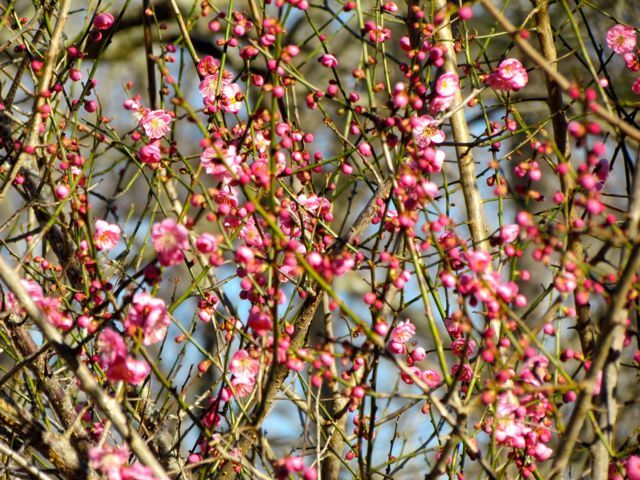 Prunus mume ‘Peggy Clarke’ (Junior) is also perfuming the air. When I realized my early-blooming gamblers were waking up, I made a quick trip around the yard a couple of days ago. 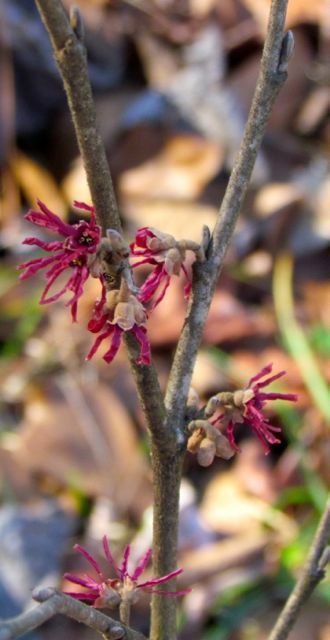 Although the January Jasmine was still barely open, My Amethyst witch hazel was in full bloom. The Cornelian Cherries (Cornus mas ‘Spring Glow’) are just cracking open their flower buds. I told them to hold off for at least another week. Betting on successful blooms this upcoming week is a sure way to lose. 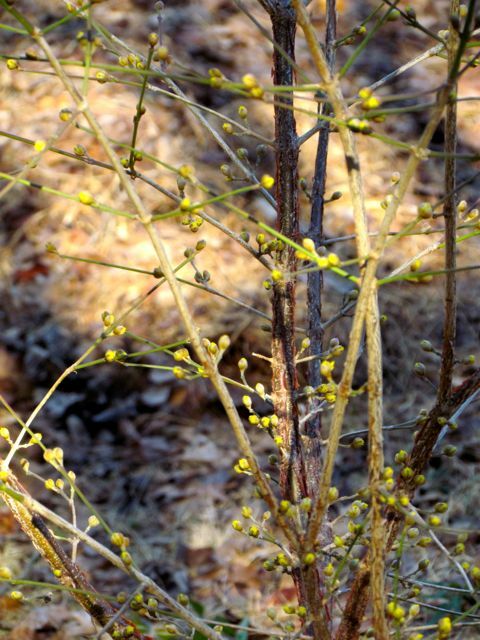 Cornelian cherry buds showing peeks of yellow. All these early-blooming gamblers may pay for their enthusiasm this week. Winter has decided to slam us hard at least one more time before allowing Spring to take over. The weather seers haven’t quite made up their minds (divergent models) about the duration and depth of the cold — and the amount of frozen precipitation that may or may not come with it, but I feel certain that early flowers will mostly meet their demise this week. 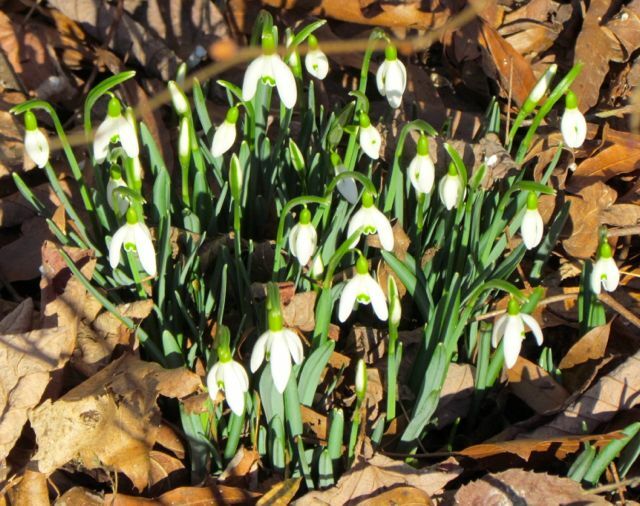 The snowdrops will probably survive, unless ice piles on top of them. I confess the impending forecast has me wondering if I’m being punished for my impudent suggestion in my previous post to defy Winter. Maybe yes, maybe no, but I was left wondering what I should do now. All the spring greens I sowed in the greenhouse two weeks ago are well up. If we lose power, they will turn to green mush, along with all the potted plants I overwinter there. Today’s mail brought my complimentary seed order from Renee’s Garden. She offers garden writers a few seed packets in exchange for publicity about her wonderful offerings. I am happy to oblige, and you can find my accounts of previous seed trials if you search on the company name. Several of the varieties I ordered this year require a lengthy nurturing period in the greenhouse before they’ll be ready for transplanting into the garden. I pondered — should I sow them now, or wait a week until the arctic deep freeze abates? 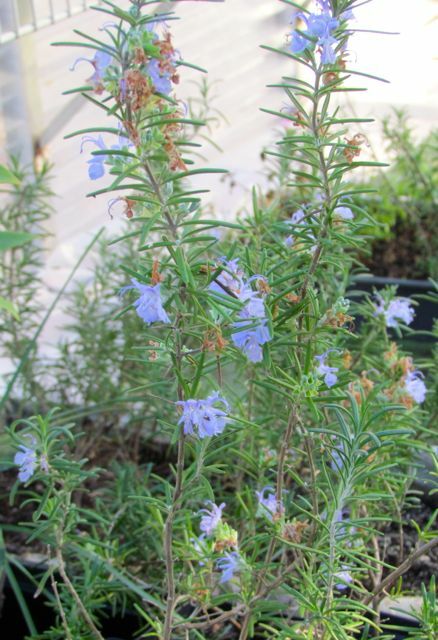 Rooted rosemary cuttings in my greenhouse are blooming happily. What the heck, I figured, I might as well double down and go for broke. I sowed the new seeds in the greenhouse this afternoon, and I fed my vegetable seedlings with a dilute solution of fish emulsion/seaweed to encourage strong growth. 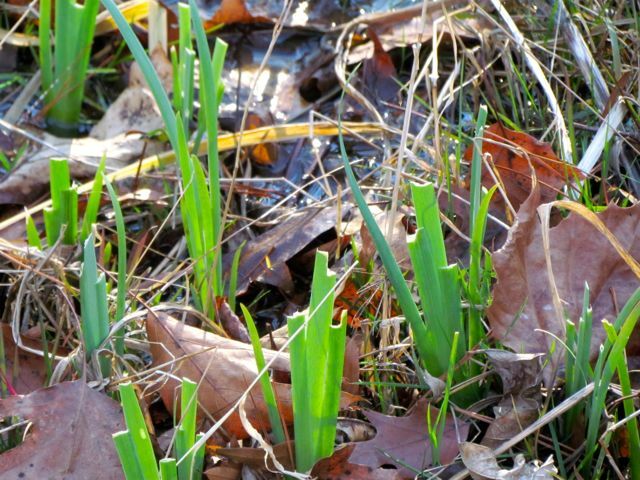 The new growth on my Louisiana irises is beating Winter but losing to hungry deer. Go big or go home, I say — at least when it comes to gardening. I’ve got plenty of leftover seeds. If all is green mush in a week, I just begin again. Here’s hoping it doesn’t come to that. 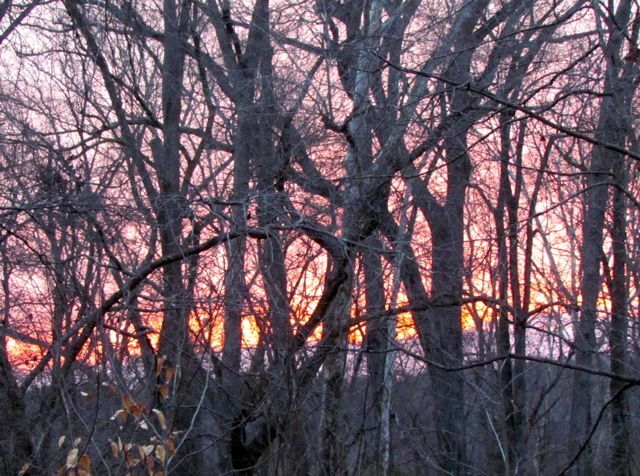 February sunrises warm Winter’s stark landscape. Soon enough, the sun will be too strong for him. 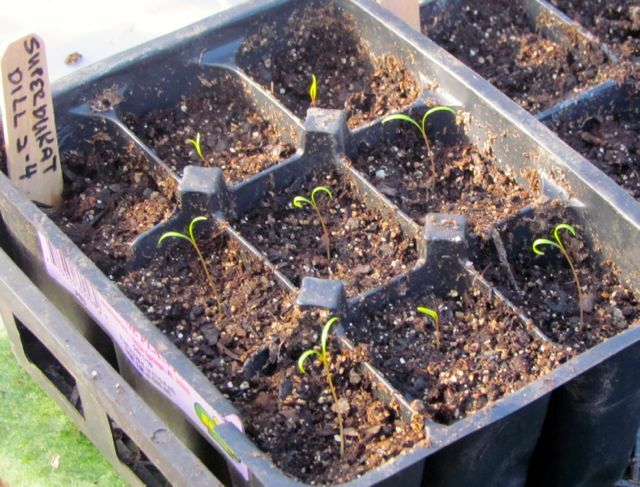 This entry was posted on February 14, 2015, 4:50 pm and is filed under Greenhouse growing, piedmont gardening. You can follow any responses to this entry through RSS 2.0. You can skip to the end and leave a response. Pinging is currently not allowed.